My Unimog campervan has a 1500mm long high level cupboard mounted over the sink/hob. This cupboard contains three "bays" each of approximately 500mm width with a single top-hinged door covering all three "bays". Because the cupboard has to hang from the roof and wall it has been constructed to be both light and flexible. 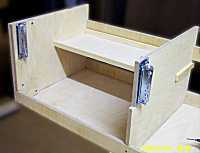 The cupboard is 450mm deep and 300mm high. The outer two "bays" have a shelf dividing the rear half. The four vertical dividers and the horizontal mounting strips are of 12mm ply. 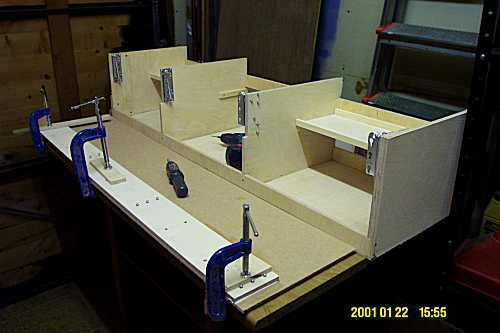 The base is of 6mm ply and the shelves of 4mm ply. 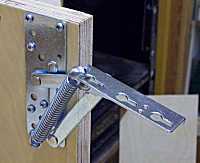 Both the cupboard and the shelf have a lip to stop item falling out when the door is opened. The unit is screwed and glued. Although the cupboard will only be used for light items it will easily carry 100kg. The lift up door is 12mm MDF with a 120mm wide strip of 12mm ply at the top to add rigidity and strength for mounting the four spring loaded hinges. You also need lots of storage for small bits, Later I added a smaller version of this cupboard, underneath the big one, for little things.